Even before the United States Supreme Court struck down the Professional and Amateur Sports Protection Act (PASPA) in May, the NBA and Major League Baseball began lobbying state legislatures for funds to finance “integrity monitoring” measures. Part of the leagues’ claim is that expanded legal wagering will create new, greater obligations for sports leagues. But what exactly is “integrity monitoring,” and how are bookmakers perceiving the leagues’ efforts to garner an “integrity fee?” In the first installment of this series, we spoke to Jennifer Roberts, Associate Director of the International Center for Gaming Regulation, a gaming lawyer and adjunct professor at University of Nevada Las Vegas, who teaches such courses as fundamentals of casino operations management. 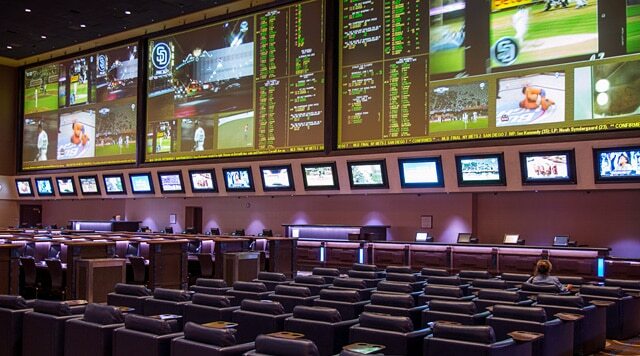 Here, to get the behind-the-counter perspective, we spoke to Robert Walker, who heads up sportsbook operations for USBookmaking. Walker’s resume also includes nearly 12 years as the director of race and sportsbook operations for MGM Mirage in Las Vegas, and before that served as the race and sportsbook manager for The Stardust. An ‘Integrity Fee’ Is Just a ‘Money Grab by the League,’ According to Seasoned Bookmaker Robert Walker. Sports Handle (SH): For quick background, can you explain to us what your day-to-day was like when you were running the MGM Mirage sportsbooks, as well as your role now with the USBookmaking? Robert Walker (RW): They’re actually very similar, just different clientele. At the Mirage, the big bet might have been $100,000 and right now a big bet would be for several thousand dollars. I don’t think too much has changed for me (from) when I’ve worked at the Sam’s Town in 1986 to now, as far as my daily routine. My first love is the bookmaking part… Obviously technology has changed. I think it’s made our lives a lot easier. SH: I’m sure it has. Can you explain for the layperson what integrity monitoring is and refers to? RW: Well, from the bookmakers’ standpoint, we monitor the lines. We know who’s betting. We’re looking to see if anything stands out, doesn’t make sense. If it doesn’t make sense, then we chalk it down. We write it down and we monitor the game. If it happens again, then we would definitely take action. You could take lower limits. You could take it off the board. I’ve done that before. Where I wasn’t sure about what was going on and was uncomfortable with the lines or the game. We would share the information needed for there to be any type of investigation, but for the leagues to say that we need them to do it is just ridiculous to me. The leagues don’t need that. Everybody wants integrity. I mean, nobody would bet if there wasn’t integrity. My standpoint is, or viewpoint is, is that we don’t need the leagues for any of that. That’s what we do. That’s all we do. That’s all a bookmaker does, is monitor the games 24-7 and look for suspicious wagers. So we don’t need the league and we don’t need to pay for that. That’s a money grab by the leagues. SH: What kinds of activities raise red flags? RW: Well, there’s a bunch of red flags that we look for, right? I think the first one I look for is somebody that comes that we don’t know, right? All of a sudden they want to make a huge wager. They ask us how much we take on game. And now, that in itself, nothing’s wrong with that. People have money. Not everybody has $10 like I do to bet, and that’s what I bet. There’s people that have you know, a $10 bet for them is $10,000. We look at that and we look at what teams they’re trying to bet. And then there are other things that we’re looking for. I can give you an example of what happened with a particular MAC [Mid-American Conference] game. In MAC, we have lower limits than we would on the SEC, because that’s pretty close to pro football, whereas the MAC is pretty close to Ivy league or something like that. So a person comes up, and says, “Listen, I want to get as much money on this team” as I can. So the next thing that happens is he says, “I want to bet it again, and I don’t care what you moved it to.” At that point, you don’t have to be a genius to figure out that this guy either really loves something or he knows something. Like I said, you’re just looking for weird behavior. Forward bets. The reason why I lower the limits … I lower the limits to make it not worth your while to bet with us. We’re diligent on the calls and we called in this particular case to Gaming ]Control Board] and the rest is history. I took them off the board completely, and just said I don’t have a good feel for this team. Bookmakers Often Don’t Catch Suspicious Activity on the First Go-Round, but They Do Help Prevent Cheating in Sports Betting. SH: Have you ever had an instance where things escalated so you had to get law enforcement involved? RW: My responsibility is, I talk to our management and then our management calls the Gaming Control Board, usually our attorney. That’s as far as we go, but I’ve never personally had to call law enforcement, nor would I, because we have a chain of command. SH: How often did you see the activity that has caught your attention? Potential manipulation? RW: Let’s say you concentrate on Sunbelt Conference basketball. You’re going to have more knowledge than most of us will, certainly, on injuries, on how good the sixth guy is, how good the guy coming in is. So you could have potential value in those areas. We always have to be careful about what is value and somebody having knowledge. There’s nothing wrong with being more knowledgeable than us and taking advantage of our weaknesses. But we’re obviously more concerned about something that doesn’t look right. I think for the most part, people know that we are monitoring these games, and… we might not catch you on the first one. It generally takes some bets and monitoring them and for us to try to figure out what’s going on. With Legal Sports Betting, the Question Is This: Why Do Pro Leagues Need More Money to Monitor? They Should Have Been Doing It All Along. SH: With an expansion of legal sports betting underway, do you see integrity becoming more of a concern in this environment? RW: No. It’s always a concern for the bookmaker. We’re concerned with it 24/7. We know who’s betting. Who the customers are. We’re required by law to vet everybody, and we do. You get to know your customers. If you’ve got a guy that spends 50 grand, you need to know him, and you should. I think integrity’s always on the forefront. I’ve got two questions. What exactly is the league going to do? And why aren’t they doing it now? RW: Why is the league saying I mean, people have been betting on their sport forever. So why, all of a sudden, they need this extra money to do the job they should have done to begin with? SH: Do a lot of bookmakers currently work with the leagues on integrity issues? RW: I can’t speak for everybody. I haven’t talked to them. I know that when we had some issues at NCAA, we always tried to work with the NCAA. They kind of threw us under the bus back in the day. Said that we never prevented a fix. That’s not actually correct. We didn’t prevent the first fix, we prevented the second or third or fourth. Right? So I mean, Arizona State [at which there was a point-shaving scandal in 1997], we came forward and said what happened there. It reminds me of saying a homicide detective didn’t prevent a homicide. Well, that’s true. But by catching the guy he maybe prevented the second or third one. Sportsbooks Often Take Lower Limits on College Sports Because There Are So Many Teams to Monitor. SH: Speaking of Arizona State, some people are speculating that college sports will now become a hotbed for potential gambling issues. What’s your response to this? Do you think the NCAA is going to have to change its approach to managing players, coaches and others around the programs? RW: I think the issue they’re talking about is already an issue. They just have ignored it. I think it’s you know, anytime money’s involved and people want money, see a way to make money, it’ll be an issue. I don’t care what the industry is. And like I said, from our standpoint, we take lower limits on college sports and we will adjust numbers quickly and we’ll monitor the games like we always did. Nothing will change from us. From their standpoint, I know the NCAA has always had conferences and talked to their players about what they can and can’t do. I don’t see how that changes at all. SH: Last question — can you see the leagues, regulators and bookmakers working together in the U.S. where each state has a different framework? RW: Do I see it? Yes. Do I want that? I don’t. I don’t see how that helps from an integrity standpoint. I think the difference is, do we give all the information needed and are we completely aboveboard? I certainly wouldn’t want to have them to be able to see all our bets. I think that is ridiculous beyond belief. For them to see all the wagers coming in, I don’t see anything relevant about that at all.